The bride is certainly the star of the show on her wedding day, but the next most important lady of the day is most certainly her mother. 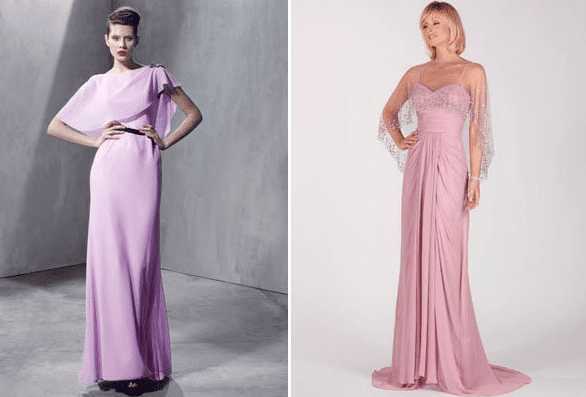 Once the bride has said yes to that perfect gown, it is also important for the bride’s mother to find the best dress to impress on her daughter’s big day. Additionally, the groom’s mother will want to dress to perfection while walking with her son down the aisle. Fear not, mothers, we’ve compiled a list of the trendiest, most flattering, and stunning dress ideas that will get you through this most special day. Lace is always a classic, most certainly on a wedding day. The lace look has especially been back since Kate Middleton wore a chic lace dress while marrying Prince William. A new twist on the lace dress look is the incorporation of lace sleeves, which leads to an elegant and slightly sensual overall look. A nod to 1970’s fashion, capes are a trend that are certainly making a comeback in recent times. Capes are a great look for mothers of the bride and the groom. For a unique spin on an old classic, try an asymmetrical cape for a fun and unexpected look. Pastels are the ideal color scheme for a spring or even summertime wedding. This season, some of the most popular dress colors include pastel sea foam, pastel blushes and pinks, minty hues of green, and pastel pale yellows: all in vogue. One of the most flattering looks you can choose for a dress is a tiered skirt dress. The fitted bodice along with a flowy, tired skirt will certainly turn heads. Whether you choose a bedazzled tiered look or a simple and elegant chiffon dress, you will certainly stun everyone at the wedding. Fair warning, these tips might be so helpful that you might steal all the attention away from the bride herself!